A story that has continued to garner significant interest in the sport of Boxing in recent years has been the emergence of undefeated unified WBA/IBO Middleweight world champion Gennady Golovkin. A fighter who has simply carved out a path of destruction in the Middleweight division since becoming world champion in 2010. Golovkin, a native of Kazakhstan has scored seventeen consecutive knockouts and successfully defended his world title eleven times. What has made Gennady Golovkin such a devastating force has been his seek and destroy pressure style that few opponents have been able to withstand. In thirty professional fights Golovkin has scored twenty-seven knockouts registering a career knockout percentage of 90%. Most recently, a title defense this past July, Golovkin scored a third round knockout of former two-time Middleweight world champion Daniel Geale at New York’s Madison Square Garden. In that fight not only was Golovkin’s power on full display, but he also showed the ability to take a punch. The champion would end the fight by dropping Geale with a right hand that sent the “Game” former champion down to the canvas. What stood out about this fight’s conclusion was not only the devastating manner in which it ended, but also the fact that it came in an exchange of right hands between the two fighters. Golovkin was not only able to knock out Geale, a fighter who had never been stopped previously in his career, but he did so as he absorbed a flush right hand from the challenger. Despite being struck by Geale’s right hand, Golovkin still maintained enough power in his own punch to end the fight. In my post-fight coverage of Golovkin’s seventeenth consecutive knockout and eleventh successful title defense, I stated that I believe the time has come for Golovkin to face fighters who are considered top stars. Although my opinion remains the same, Golovkin will have one more test to pass before fights against fighters who are considered marquee attractions can be discussed. The test that awaits the champion could possibly be the most dangerous to date. The challenger? Marco Antonio Rubio. Rubio, a veteran of sixty-six professional fights has been a long time contender in both the Jr. Middleweight and Middleweight divisions and has twice fought for a world title. Much like Golovkin, Rubio is a pressure fighter who is known for his punching power. Much like the champion, the challenger has in his own right shown an ability to compile knockout streaks and has himself registered an impressive career knockout percentage of nearly 78% having scored fifty-one knockouts in fifty-nine career wins. Although Rubio has come up short in his previous two shots at a world title against Kelly Pavlik and Julio Cesar Chavez Jr., he is definitely not someone to overlook and should be viewed as extremely dangerous. The question that I have as this fight approaches is what kind of fight could this look like? Conventional wisdom suggests based on not only each fighter’s style, but more importantly each fighter’s punching power that both fighters will be looking to trade punches right from the opening bell. Even though this fight has all the makings of a tailor-made shootout between two power punchers, it will be interesting to see if either fighter changes his approach and begins this fight at a tactical pace perhaps in thinking that the other is expecting his opponent to go toe to toe from the outset. It will be interesting to see how the champion will respond should he get hit flush by Rubio as he did in his last fight against Daniel Geale. Although no one can take anything away from the valiant effort Geale put forth against Golovkin, an argument can be made that Rubio hits harder than Geale, who is a highly skilled boxer, but is not known for his punching power. It will however, be of equal interest to see how Rubio will respond to Golovkin’s power, particularly if Rubio were to get caught in exchanges with the champion. Rubio has been caught before while in an exchange and that ultimately led to his downfall. Some may remember Rubio’s encounter with Kofi Jantuah in September 2004 on the undercard of Bernard Hopkins vs. Oscar De La Hoya in Las Vegas. A fight where Rubio entered having knocked out his previous fifteen opponents, this fight would end almost as suddenly as it began. In an exchange of left hooks between Rubio and Jantuah, it would be Jantuah’s that would land flush on Rubio’s chin knocking him down and out in just thirty-three seconds of the first round. Although some may be tempted to view Rubio’s loss to Jantuah as a possible scenario of how this fight could play out, it is important to remember that the fight between Rubio and Jantuah occurred ten years ago and it was a scenario where two fighters each threw power punches, and Jantuah’s punch simply got to Rubio before Rubio’s punch could land. It was a case of a punch that landed right on the button, but a scenario that could have easily gone the other way. To his credit, Rubio did bounce back from what was a devastating knockout loss to challenge for a world title twice in his career after that fight and has remained a top contender in the years since. Nevertheless it will be interesting to see if Rubio keeps in mind how Golovkin’s last fight ended in that although he was hit flush in an exchange, he was still able to land the knockout blow after absorbing that punch. Although there may be some who believe that this fight is destined to end in a knockout, it would not surprise me if a tactical fight takes place. An interesting question that will emerge coming out of this fight will be what could be in store for the winner. With WBC Middleweight world champion Miguel Cotto not expected to fight until sometime in 2015, the newly crowned IBF world champion Jermain Taylor’s legal problems at least temporarily delaying what could be a fight between Taylor and IBF number one contender and former world champion Hassan N’Dam, and the recently vacated WBO world championship being vacated by the undefeated Peter Quillin, it will be interesting to see how the winner of this fight will factor into the equation. The main storyline of this fight however, is an undefeated unified world champion’s ongoing path of destruction against a fighter who could well be looking at this fight as his last chance to win a world championship. 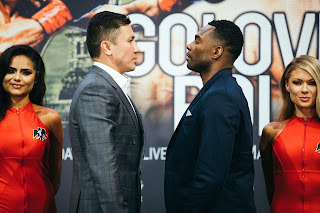 No matter what happens when Golovkin and Rubio meet at the StubHub Center in Carson, California on Saturday night, whomever should emerge victorious, this observer believes that the ingredients are there for what just may be a great fight.